Choose to become a publicly heard, working musician and it’s somewhat unavoidable that the music listening populace will develop a frame of reference from one album to another, simply due to the self-contained nature of a single record. Some artists embrace these default divider lines more than others; either choosing to try heavily divergent styles of sound between releases or, to deeply focus on particular moments in time as a source of inspiration from one to the next. Brooklynite bedroom-songwriter, pronoun, known off-stage as Alyse Vellturo, is only one EP into her exciting, unfolding career. However, with the recent release of new single, “run,” listeners are getting a first glimpse into pronoun’s penchant for the latter over the former element of importance – at least for this moment in time. While pronoun is often referred to as an artist of the lo-fi variety, sonically speaking, the finalized blend that makes up “run,” plays out to the contrary. Nuanced performative approaches taken by pronoun with the previous EP reappear (Vellturo’s extremely fine, almost staccato-like enunciation of lyrics for example,) as well as a more broad stroked preference for applying ample amounts of delay, reverb, and creating the sense of a spacious recording environment for the collective mix. 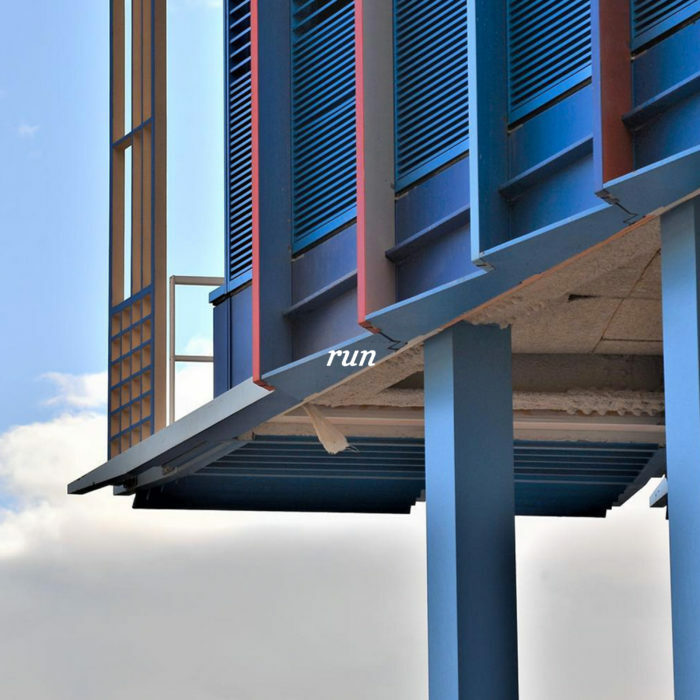 The conceptual content of “run” might be partially looking back as part the closing epilogue to there’s no one new around you (Rhyme and Reason Records, 2016) but it still manages to feel like a movement of growth because the combined teamwork of mixing engineer (Steve Vealey), mastering engineer (Jon Marshall Smith), and Vellturo’s own improved finesse with production take her music’s familiar aesthetic and simply refines it beyond where the EP had stopped. Guitar tones are crisper. Drum hits are sharper and more defined. The balance between Vellturo’s quieter style vocals and the expansive, layered, occasionally overlapping sounds of “run’s” instrumental backing is more even. The song sounds bigger overall but the pieces all keep up with each other and the improved clarity increases the appeal of Vellturo’s performance without forcing an artistic change to compensate. The simple, contextually malleable chorus (So you’re gonna run / I can see the way this will go down) pairs ridiculously well with the emphatic lead guitar solo in the bridge to even give “run” great sync placement appeal. Whether running to something, from something, facing a long journey, or a complicated undertaking, there are a plethora of ways pronoun’s newest single could be made the companion of other media like commercials, a dramatic television scene, or maybe even as the promotional theme of the next dramatic film of the year. Furthermore, seeing as Vellturo isn’t just an artist but also a scrupulous label manager and all around music industry-savvy individual, listeners aren’t given much room to predict what pronoun will have to say or exactly how said messages will sound (both in and out of the studio) when they are disseminated. It’s in this regard that listeners – music minded or casual fan alike – might find the lo-fi label not so erroneous but conversely fitting, in much the same way “indie” has come to characterize two distinctions: technical applications and intangible attitude. Listeners get a basic, easy to follow story line with “run” and if they should stop there, pronoun’s offerings seem all too tried and tropes. What gives the elevator pitch of “run” so much depth is being invested in pronoun musically and outside of what makes it onto Spotify. Seeing how casually pronoun elects to let listeners see so much of her thought process – the ecstatic, the bored, the embarrassed, the frustrated, the disbelieving, the self-doubting, and the successful – there’s very little stopping new fans from finding that initial connection with the catchy quality of “run’s” expertly crafted hook and then finding the unexpected in the space that makes up the compositional and real life journey between the music of pronoun’s present and that already underway for the future. Understanding that “run” is a conclusion of sorts and that not only the musical but experiential aspects of Vellturo’s future music are now completely open, pronoun is at a flexible juncture and any fans who find their way to her music between now and the next release are sure to be nothing but brimming with anticipation that’s as straightforward as pronoun is humble. “run” is available now through iTunes, Amazon, and streaming on Spotify. Currently pronoun is in the swing of what will be a season of touring with multiple artists but is coming back to Brooklyn for a show at Warsaw tomorrow night. Full show details are below.